Last year in February, WhatsApp CEO has said that, company is working on voice calling features for this most popular messaging app and now it seems WhatsApp is slowly going to roll out this feature for its users. Recently WhatsApp has rolled out WhatsApp for Web features which many users has asked for and it allows you to mirror your device WhatsApp to your PC/Mac and you can view images/videos or chat with your friends using your computer. One Reddit user pradnesh07 seems to be able to activate this, calling feature on his device and he has posted some screenshots of this feature, user also mentioned that he had grabbed the latest version of WhatsApp (v2.11.508) from the official website and he is using Nexus 5 running on latest Android 5.0.1 Lollipop. But he also adds that to activate this features, a person who has this feature working needs to call another person who wants this features, overall its like an invite system in which the person who already got this feature, needs to call another one who wants this feature. 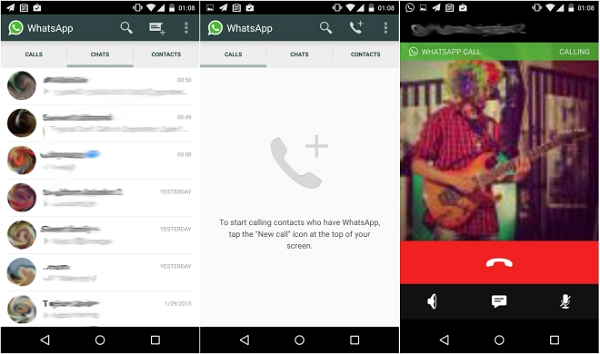 From the images we can see that this latest version of WhatsApp with call feature enable will change the UI of WhatsApp and now you will see three tabs on top – Call, Chat and Contacts. The calling interface seems simple and standard which has disconnect button, along with speaker, messages, and mute. Last year company has said that they will roll out calling features but they will also ensure that this feature will work seamlessly on slow internet connection as well. Recently Hike has also announced calling feature on its platform and Facebook Messenger, Google Hangout and Viber are already providing this feature, so it will be interesting to see how WhatsApp calling will make a difference.